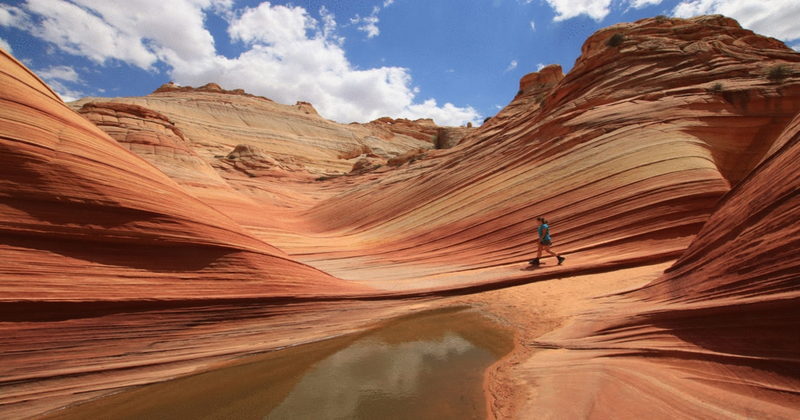 Nestled inside the Vermillion Cliffs National Monument is a place best known as The Wave. In my mind, it is undoubtedly the Eighth Natural Wonder of the World. Its pristine beauty and jaw-dropping scenery are indescribable through words. Thanks to the lottery system in place, only 20 lucky souls per day get to experience this natural wonder. 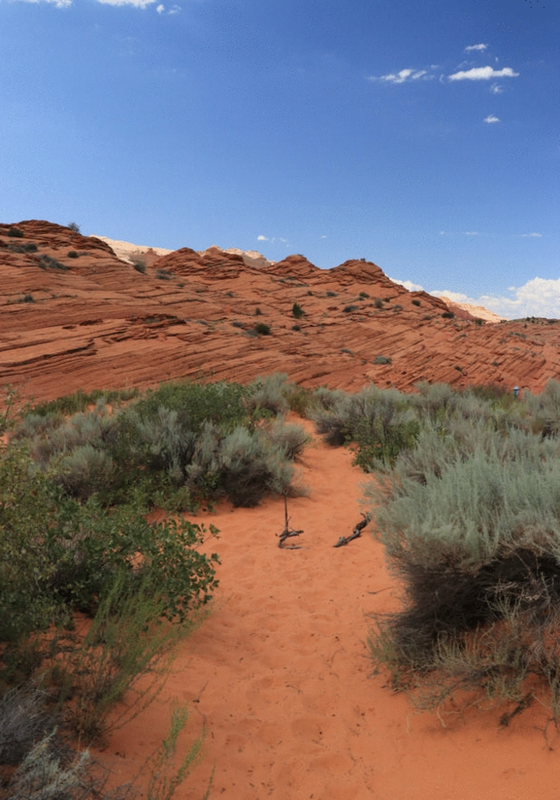 There are two ways to obtaining a permit to hike within Coyote Buttes North (The Wave). The first grants 10 permits through the online lottery system. 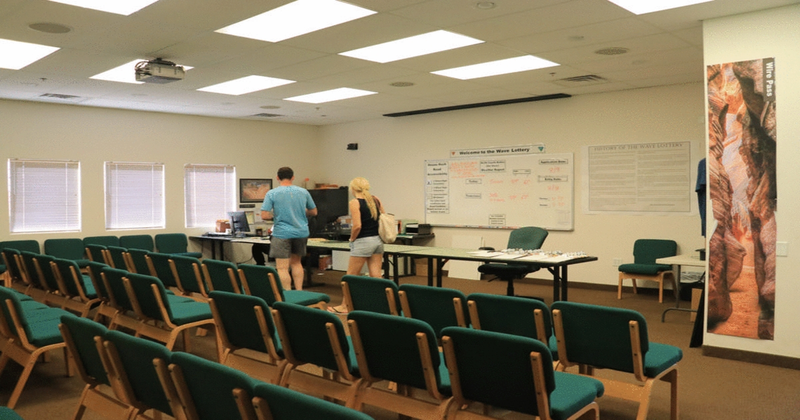 The second is by showing up to try your luck for one of the 10 at the walk-in lottery. If you search the information highway, you will find countless blogs with tips on obtaining this permit. Here are some words of wisdom: you’re either going to get it or not. A few weeks ago we showed up hoping to get a walk-in permit. There were probably 75 people in the room that day. The first number called for a permit was for a group of six people. So, what’s that mean? That means only four more persons are going to be granted their dream that day from the walk-in lottery. We went back a few days ago, and there were probably 125 people in the room. Guess what… yup, we got one. This is the room where so many corral to see if their dream comes true. 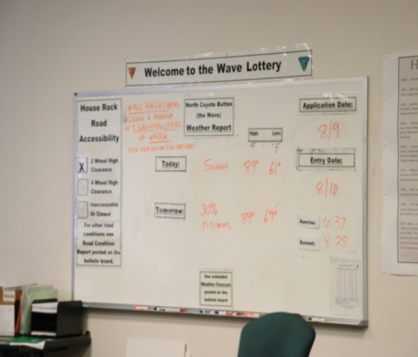 Pro tip: Since the difficulty of obtaining a permit for The Wave ranks up there with the Enchantments, Havasu Falls, rafting in the Grand Canyon, Half Dome, and Selway River rafting, it goes without saying… do the right thing and wait in line like everyone else. Some updated stats provided by the BLM. Are there going to be people that buck the system and attempt to go out on their own? Sure. It’s human nature. We crossed paths with a couple people on the trail as we were leaving who clearly didn’t have permits. How do I know this? I asked. I wasn’t trying to go all trail police on them, but as they got closer I said,”Hey congratulations on getting a permit! Do you guys need more water?” When they responded with,”How far is this hike?” Immediately, I knew that they did not obtain a permit. They had absolutely no idea what they were getting themselves into. 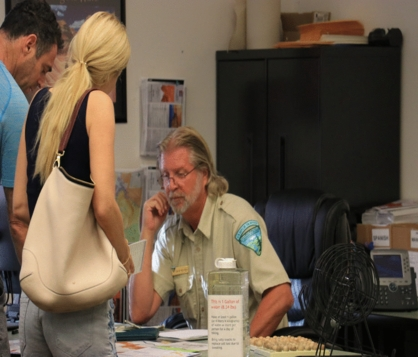 When you get your permit, you’re going to get briefed on everything having to do with this hike. This man is knowledgeable on many things in the area. He will provide lottery winners with details to ensure safety and preservation of Coyote Buttes North. I’ve always been told that if I’m not part of the solution that I’m part of the problem. In my opinion, if we don’t make it a point to police each other up on the trail, then we’re doing no good as stewards of the backcountry, the sport of hiking, and the permit system. I’m not saying that we should report everyone we see on The Wave hike to the BLM office. We should, however, make it a point to ask how people are doing, if they have enough essentials, and wish them a great hike…regardless of what trail we see them on. This hike, in particular, can be demanding even for the experienced backcountry adventurers. Heading up the sandy Slickrock ready for adventure! If you one of the very few chosen, you’ll be asked to remain in the room for a safety brief. You’ll even be provided a map with pictures on it. Please listen to everything they have to tell you. This was my third time, but I still take safety briefing seriously. Because this trail isn’t marked, per say, it’s important to listen to any changes that may not be on the map they provide you. One of the most important things that I gathered from the briefing was that there was possible flooding along House Rock Road. Pro Tip: Watch the weather. 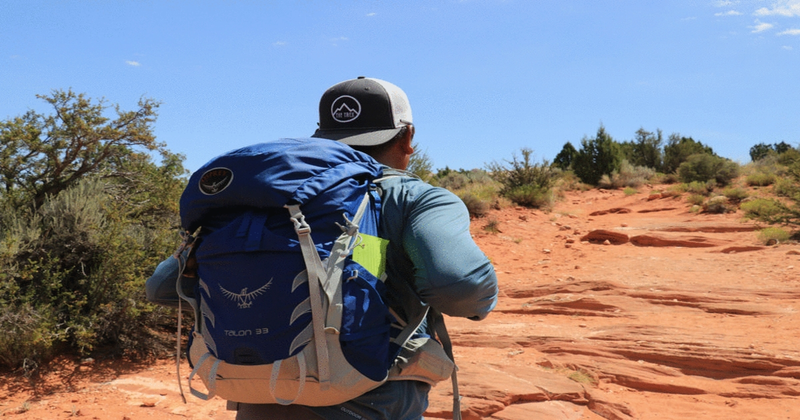 Your permit to hike within North Coyote Buttes is for the following day, not the day you receive the permit. If there’s heavy rain in, or around Bryce Canyon, chances are there will be flooding. That water will drain into Buckskin Wash and it may be impassable with a two-wheel drive vehicle. House Rock Valley Road can be impassable when wet. 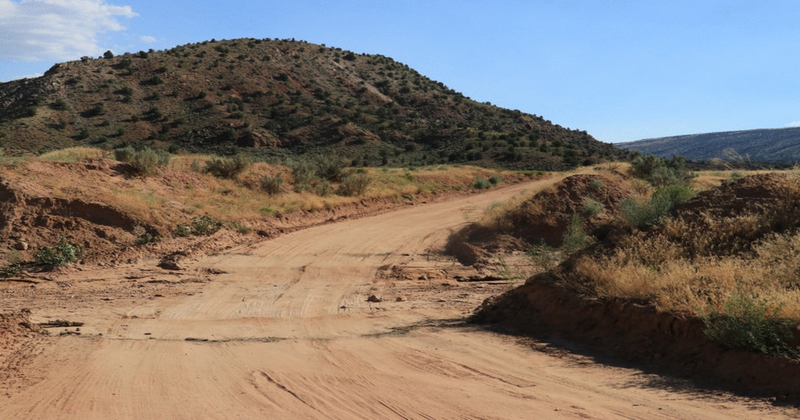 This is Buckskin Wash and when it rains in Bryce, rest assured that this can possibly be flooded. During your briefing, you’re going to be told about the importance of water. These people aren’t playing with you when they tell you about this. Take more water than you think you need. There is zero water along the trail. Map reading and a keen route finding ability are going to be your best tools in navigating the route. 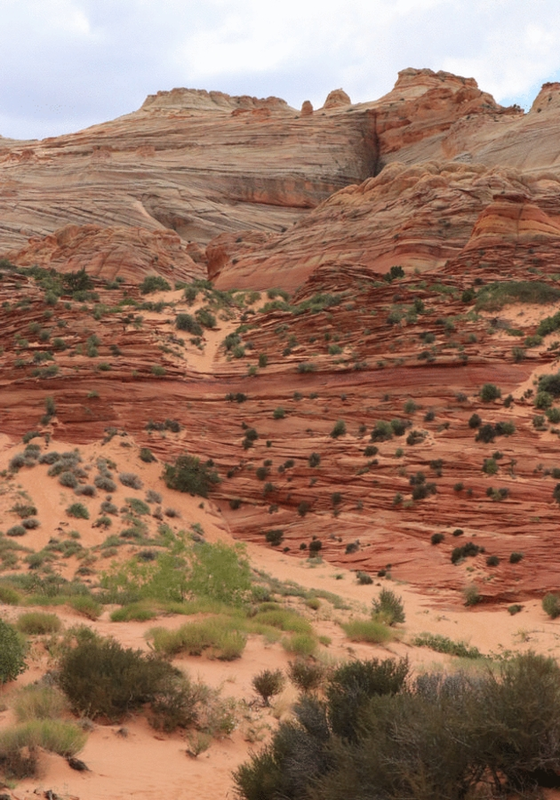 Often times, the red sandstone holds high levels of iron which can cause electronic GPS devices to function improperly. Aside from making sure you and everyone in your party have enough water, remember that this route primarily runs North to South and is an out and back route. Starting out the sun will be in the East on your left on your way to The Wave. Depending on how long you stay out there exploring, the sun will eventually shift creating the terrain to look incredibly different than when you began. Be sure to take photos while you’re on your way to The Wave both in front of you and behind you. This little reminder may make the difference between staying out there five hours versus staying out there ten hours. 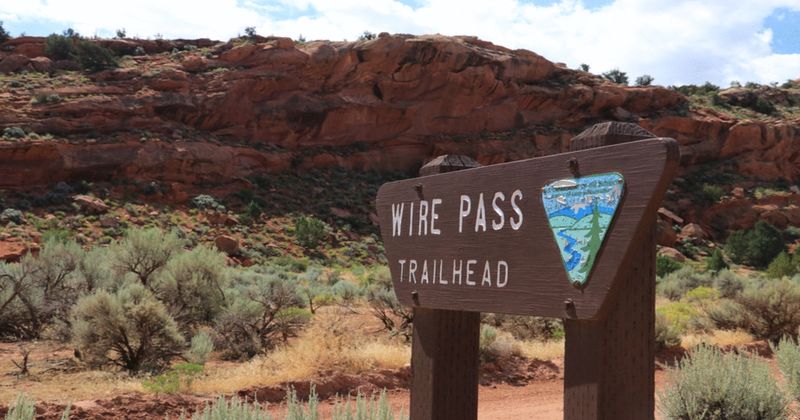 Wire Pass Trailhead is the same for Buckskin Gulch and The Wave. Did you really think that I was going to give you the play-by-play? Although The Wave is no secret, all that I’ll do is provide you with enough information on how to properly obtain a permit to hike this once-in-a-lifetime spot. There are many out there who believe allowing 20 people per day is too much. On the other hand, all the folks who haven’t been lucky enough to have their number drawn will probably contest that 20 is too small of a number. I, for one, can appreciate the dedication that the Bureau of Land Management has put into preserving this area by maintaining such a lottery system. On our trek to The Wave a few days ago, it was apparent that the folks that have been fortunate enough to make the journey practiced the Leave No Trace Principles. 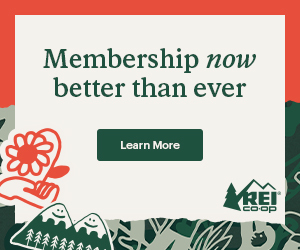 I hope that the same methods get practiced on trails worldwide so that we can continue to be avid conservationists of this sport we love so much. I won’t give you the step by step route description because I feel that everyone should have a fair shot at obtaining just as I have on three separate occasions. However, what I will do is hook you up with a few pics from our journey from a few days ago. If you don’t live close enough to make the drive to make your dreams come true or have them shattered in a matter of minutes, then I encourage you to try your luck at the online lottery. If you do find yourself some day trekking along the beautiful sandstone of Coyote Buttes North, take the memories with you and share your experiences with others and educate them on why places like this require a lottery system and how easily it can be ruined if we do not all work together and abide by the procedures put in place to preserve this fragile area. Be prepared to trek through some heavy sand both up and downhill. 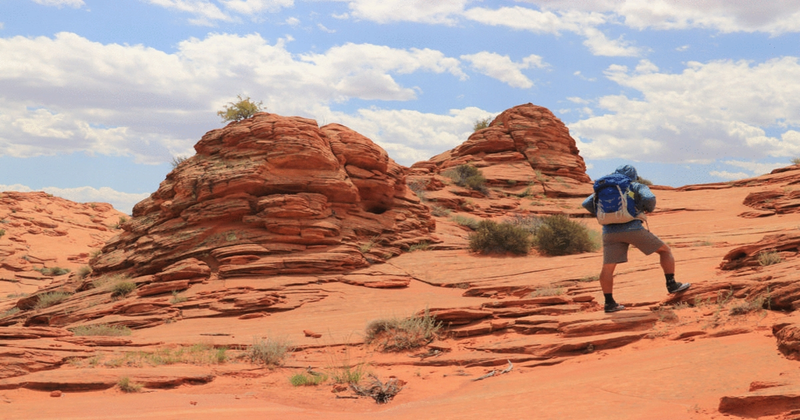 The textures of Coyote Buttes North are breathtaking and will have you gazing for hours. 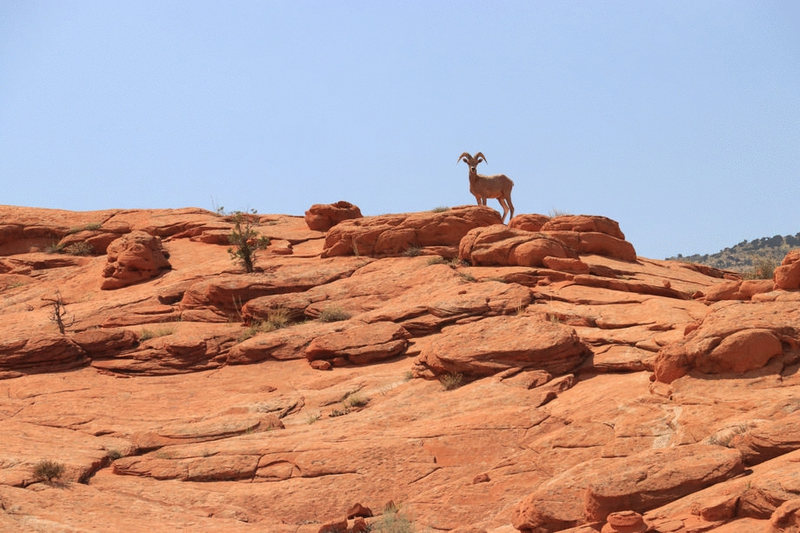 Bighorn Sheep and other animals call this place home. Always practice Leave No Trace principals while trekking through their backyard.